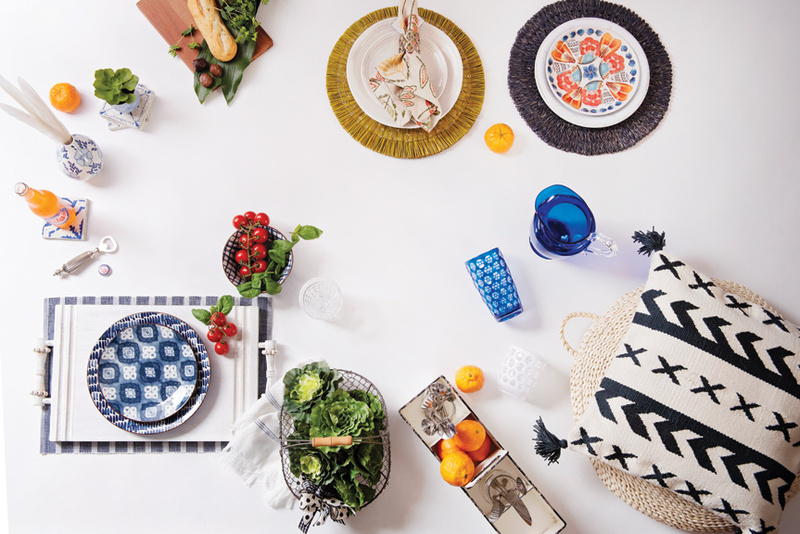 Take your next dinner party outside with a beautiful, and practical outdoor tablescape. Take your next dinner party outside with a beautiful, and practical outdoor tablescape. Your guests will appreciate dining under the stars with dinnerware and servingware meant to withstand the elements. Blue-and-white vase with feathers, Blue-and-white succulent vase and blue-and-white coaster set, available at The White Rabbit. Bottle opener, blue-and-white bowl, cotton napkin, salad plate, dinner plate, white washed serving board and placemat, available at The Marketplace at the Abbey. Lattice napkin ring, freya napkin, Peyton salad plate, Peyton dinner plate and seagrass round placemat in gold, available at Christopher’s. Juliska seashell melamine plate, white melamine dinner plate and Juliska blue delft loop placemat, available at Mary Tuttle’s. Mario Lucca blue pitcher and glass, available at Mary Tuttle’s. Wire basket with faux greens, available at F.O.B. Lente white tumbler, available at Christopher’s. White tin tray, available at Gifted Gardener. Black and ivory pillow, available at Gifted Gardener. Straw floor cushion, available at SC Home by Forshaw.